In spirit of fairness Could we give this some room for a new point of view? And, could it be true that some could be tempted To use this mistake as a form of aggression? Something was pouring from his mouth. He examined his sleeve. Meeples. Crimson, solid wooden meeples. Greetings, traveler. I'm David Morcerf, insane gamer. Most of you will probably know me already from my extensive canon of 2R1B PBFs including PBF#89 in which a mutated role-card attacks BGGCon. Back in the 1990s, I wrote, designed, and starred in David Morcerf's Cardboard Cutouts, a radio program so radical, so risky, so dangerous, so goddamn crazy - heh - that the so-called 'powers that be' became too scared to post it and gypped me. —Much in the same way that women have ever since they sniffed out my gold tokens. Only now in the worst artistic drought in geeklist history, does the community come crawling back — first-player token in hand and suitable ashamed — asking if your humble megalomaniac could once more retrieve Cardboard Cutouts from the boxes in his spacious walk-in closet and let it loose on its unsuspecting public — that's you. I'm DeMorcerf, author, dreamweaver, designer, plus historian. You are about to enter the world of my imagination. You are entering my Cutouts. This is Cardboard Cutouts: People as Boardgames, An Analogical Study and Social Commentary. In this episode of Cardboard Cutouts, we will see what happens when the dark, occult forces of boardgaming turn against us. When, like some Kafka-esque nightmare, we find ourselves metamorphosing into the very games we play, when we find ourselves becoming the play-thing. So come along with me, as I lead you on a travel through time in my geeklist, (which also travels across servers like any other internet content). Working herself to exhaustion at her university office, Erin the Red brushed sweat from her brow. Yet another set of feathers cataloged, yet another set to measure. Of course, the applications for research funding hardly write themselves either. A peer walked by and jolted her back to an alert state with a joke. Erin let out loud, booming laughter and made her way out of the museum, but her tired mind forgot to duck and hit the door frame. Rubbing her head, Erin headed home to her apartment, yawning the entire way. She scratched her cat's head, laid out his food bowl, and set to work again at her kitchen table while cooking a late dinner. Then the boiling pot of water began to fill the room with a strange fog. Lost in the fog and falling into another world, Erin passed out and the transformation began. Her strong voice, penchant for causing rowdy fun, and scientific mind formed into a loud, party, stock-market game. Her red hair forever immortalized as the red box topping the game. The world's liveliest ornithologist was now the world's liveliest party game. I'm one of the few people you'll meet who've reviewed more games than they've played. I felt I'd taken the thread reply as far as it could go. I guess it was inevitable that my imagination would make the move to geeklists. Whistling on his way home from school in Canuckville, Canada, BlueTorch had no idea of the fate that awaited him. It seemed like just another normal day: greeting the wife, entertaining the kids in spite of his own exhaustion, aches and pains, and putting the kids to sleep before working on the next day's lesson plans. Burning the candle at both ends in his office, he fell asleep at his desk. Game components on one side of his drained husk and mathematics lessons on the other, the dark and evil occult forces of gaming attacked his spirit. As the night progressed, his slumbering body entered a cocoon and his metamorphosis began. Chest turned to gridded board, limbs turned to miniature robots, organs turned to tokens. Mathematical, yet family friendly, but strategic, this smart game that favours fun alongside victory was the game born from BlueTorch's transformation. I got a geek item. Read it. Tickled me senseless. Calmed down a tude. And I said to DeMo, I spoke right into my mic, I've never been afraid of forcing someone to get on Mumble to hear what I have to say, it's natural. I said this is going to be the most significant geeklist ever since Caitlin's Cats in Boxes, and I do not say that lightly. After a long day at work, programming the ResistanceBot beckoned. Caitlin grabbed her laptop and collapsed onto her bed. Her cats, seeing a keyboard in use, climbed onto the quilt to attempt to "help" her with the work. Suddenly, the cats jumped from the bed, screaming and hissing as they did so. The trio of felines began to run in circles around the bed frame. Frightened Caitlin attempted to get up from the bed but instead fell backwards. Finding herself lying down against her will, a strange weight grew atop her. She felt her body become heavier and heavier as she fell into the mattress. Desperate she once again struggled and willed herself up, but then a large ghoulish hand rose out from the pillows and pushed her down. As she fell deeper, the bedding enveloped around her closing her off from the room and the light. Inside the dark netherworld within the mattress, the intense pressure compressed her human body into a new form. Her analytical ears becoming voting tokens, her helpful hands transforming into teams, her deceptive eyes morphing into hidden roles, and her lying face turning into hidden mission cards. When Scout returned home, she found the cats meowing loudly at the bed and scratching at the bottom of it. When she looked underneath the bed, she found what remained of Caitlin -- a deceptive game. Slathe took his handkerchief from his suit pocket and wiped his brow. It was a big day for his career. He straightened his jacket as prepared to enter the courtroom. As a powerful attorney, Slathe carried a reputation for playing unfair and seeming emotionally defective. In spite of this, at his core, this was far from the case and only appeared as such when others treated their interactions with this crude expectation. In court, Slathe kept his strategy unpredictable: sometimes unique, sometimes highly-aggressive and confrontational, other times just running a staring match, but always intriguing. As Slathe objected to a non-relevant line of questioning from the opposing counsel during cross-examination, the Judge slammed his gavel down. The sound of the gavel was louder than Slathe had ever heard before -- it sounded heavy and strange. So heavy was the banging of the gavel that Slathe could feel the physical wave washing over his body. Bang. Bang. Bang. Again and again. Slathe's body shook as he was knocked back on his feet. He stumbled and stepped backward and then fell. Feeling weightless -- buoyant in the sound -- Slathe found everyone in the courtroom drifting away, the courtroom darkened, and he was pulled into a whirlpool forming in the witness stand. Sinking into the cold void, Slathe's body contracted and compressed. His digits turning into wooden discs and cubes, his nails into coins, his muscles and organs into cards, and his skin into a large board. Back in court, the room turned back to Slathe's table, but he was gone. The witness hit her foot on something and with a puzzled look pulled a game box out from under her seat. Confused and angered, the Judge sat demanding to know who placed it there while calling a recess. Yougurt had just finished playing with his son after work, and it was time for his monthly trivia night. He drove to the local bar for the night looking forward to the fun and chance to unwind from another week of drudgery helping the helpless people calling for support. This time, it would be a long night because his friends were combining trivia night with a game night. Yougurt was prepared to get wild and let loose. During the questions, Yougurt buzzed in quickly and boldly flying by instinct. After trivia ended, he challenged his friends to a game of Perudo. Turn after turn and round after round, Yougurt glanced at his dice only briefly. 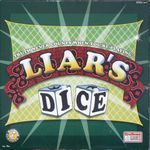 He was a natural risk-taker and showed no hesitation with his claims about the dice on the table. Due to his reputation that he could never be trusted, not even to consistently lie or bluff, his friends hemmed and hawed, sweating bullets through the match. At their request, the game had become a drinking game. Consequently, Yougurt was even more of a wild-card laughing hysterically as others lost die after die. As the match became more tense, Yougurt took a shot and looked into his glass suddenly feeling queasy. His eyes turned to the cup of dice as they tossed and turned inside. Without warning, his head slumped and fell toward the cup. Like Alice falling into the rabbit hole, Yougurt found himself in the air falling into the opening of the cup. No larger than the dice, Yougurt shook and thrashed about inside. Breaking against the cup, crushed by the rumbling dice, his body turned to gum and was pressed, folded, and worked into the components themselves. Phelanpt Feb 11, 2:15 PM: evils have mostly stood by and watch goods fall. except for emme. she's spinning them round and round. Emme grinned from ear to ear. She had just won yet another game of Two Rooms and a Boom after gathering a large group to teach. Her alliance building and politicking had her running circles around the other players. In spite of never knowing when she might betray or deceive them, her talking and negotiating prevented them from thinking of her as a hussy face. Preparing the next game, Emme put in several untested, new roles that she had heard a voice ask to be added. As the game started, she looked at her role card and did not recognize the role. 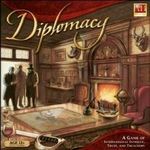 The card said "Diplomacy; Board Game team". Stuck in place from confusion, a friend approached to ask for a reveal. Hesitantly, she nodded in agreement. However, she found her eyes frozen to her card. The lights began flashing, and she felt light-headed. Someone yelled out, "Hey, who left this copy of Diplomacy on the floor? I just tripped on it... Hey, who dropped their role card on the floor? I just found it under here." As he looked at the card, he mumbled, "Hmm, Emme, Human... I don't recall that role." 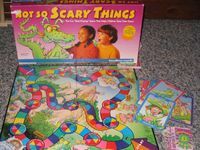 I have never metamorphosed into a board game. But I know what it would be like. Don't ask me how; I just know. I've always just known. 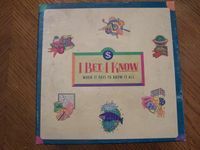 Now I don't know whether someone close to DeMo had turned into a board game, whether it was a colleague or pet. But you could tell the geeklist meant a lot to him. There were tears on Mumble. Not from DeMo, he was strong for us. But I wept, I'm not ashamed of that. I suppose its one of the many burdens he has to bear as an artist in bringing us this gift. D.B. put his long body extension into the air, and the leader of the seminar acknowledged his desire to contribute. D.B. opened his word producing and amplifying source. He had many things interesting and abstract that he wanted to send to his fellows' ears in the seminar. He motioned his digit attachments back and forth in the air in front of him. But all the things in his top body part kept getting jumbled and paused on their way to the thin megaphone underneath. As he got caught up and stuttered, the nothingness that could be sensed became greater in mass and density until it collapsed and pressed hard down upon him. D.B. was no longer a bipedal organism. He was a thing that people come together around and enjoy. Clyde showed up to play the game and began claiming to be Merlin, Percival, Oberon and the President. He immediately started pointing at people and calling them spies as soon as he entered the room. Everyone simply stared at him as they had no idea what he was doing. He had entered an Italian restaurant by mistake. A shadowy figure came out of nowhere before him. The hostess handed him a menu and he replied, "Nah, I don't need to read the rules." Bored that no one else was responding to his play, he left to drive home. As he walked to his car in the parking lot, a strange growl echoed behind him. Driving home, he got his phone out to post on BGG. His phone started flashing inexplicably, so he put it away. When he got home, his game group was there playing a new game that he was interested in. They insisted that if he wanted to join, he had to at least look at the rules because it was too complicated for them to explain it all. With a sigh, he grabbed the rulebook just to pretend and placate them. He opened up the rulebook and looked down at the page. The rules were indeed complicated. He skimmed over the page. He turned to the next page and a black hole on the page sucked him into the book. Then the rulebook's black hole spit Clyde back out in a smaller fashion, as a series of werewolf game role tiles. Darkness and rain. Cold, freezing darkness and rain. Jarek walked into the door and took off his soaked little red sneakers. He shuddered as he acclimated to the warmth of his home. He wondered how many players would be active on the PBF at this hour. Just as he was about to turn on his computer, a knock came from the door. Curious, Jarek whipped around to face the door, his tail flying around him. He approached the door and responded, "Who's there?!" Jarek's interest was peaked. "Cuzifeyere who?" Greatly amused by someone sharing his strange pun sense of humor, Jarek laughed as he opened the door with his little dino arms. He thought it sounded like his friend Emme. However, when he opened the door, he saw a flash of lightning and himself staring back at him. Except it wasn't him because he was still himself... wasn't he? This imposter grinned at him and winked. Then it cricked it's neck. Impulsively, Jarek shook from the eerie chill it engendered in his body. "OhHhh yeah, that's exactly what I want to do right now --Not." "Maybe if everyone close to you had become a board game, you'd be sarcastic, too." "Not yet. I'm not sure if it can ever be the way it was..."
Johnny took another step forward, but this time his foot didn't stop. It kept falling, and so did he. Face first he slammed into the snow. The cold enveloped him as he slipped down under winter's sheet. He couldn't move against the weight of it. He couldn't breathe. His body froze to ice. Time passed and then something changed. His body was compacted under the snow until it heated up inside. The snow around him melted and evaporated revealing a renewed Johnny -- a warm, caring, cardboard Johnny.